It folds for easy storage and travel. Comes with a small compact carrying case. If reaching to clean with toilet tissue is too difficult, then the Buckingham Compact Travel EasyWipe offers the perfect solution. The long, easy to use toilet aid enables users to wipe with ease. "The COMPACT personal hygiene aid that reaches and cleans where you can't." 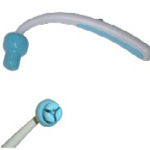 The EasyWipe features a soft, rounded silicone end for attaching toilet tissue or wipes, and a push button end to release the tissue or wipe after use. 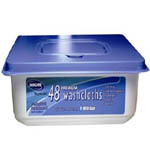 It's light, sturdy, and easy to keep clean. Extended, the wand measures 14-7/8" long. 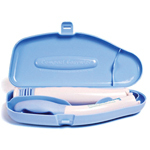 It easily folds to measure 7-1/2" and fits snuggly in the hard, compact carrying case provided. 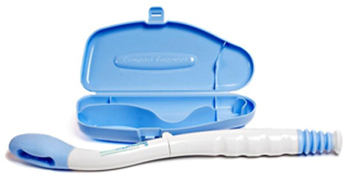 The Buckingham Compact Travel EasyWipe is ergonomically designed, making it comfortable to hold, especially for users with Arthritis, limited grasping ability and limited mobility. FOR EXTERNAL USE ONLY. International Patents Pending. PLEASE NOTE: Due to hygiene concerns, this product is non-returnable.